Fredericksburg, VA---Fredericksburg Baseball began the organization's inaugural season ticket drive on Saturday with resounding success. Its "Founders Club" event was held in historic Market Square in conjunction with the Fredericksburg Area Museum, and was attended by hundreds of fans. In total, more than 185 individuals and groups joined the Founders Club on its first day, representing more than 600 reservations for full season ticket plans. By joining the Founders Club, these fans lock in the ability to be first fans to select their season tickets at the team's new state-of-the-art ballpark scheduled to open in 2020 in Celebrate Virginia South. The first fan in line, Mr. John Ragsdale of Fredericksburg, Virginia, arrived at 3:30 am to ensure that he would have first choice of seats at the new ballpark. 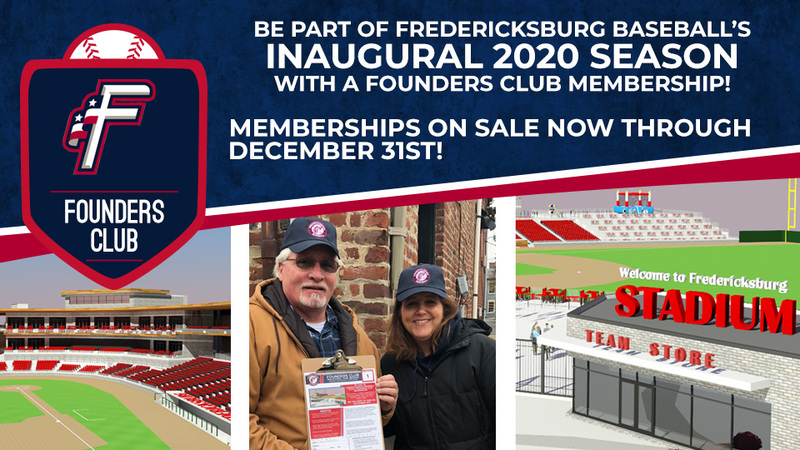 In appreciation of his dedication and love of the game, Fredericksburg Baseball's ownership informed Mr. Ragsdale at the event that his season tickets for the inaugural 2020 season would be "on us." Potomac Nationals Team President & COO Lani Silber Weiss expressed the team's appreciation for the support received from the fans attending this event. She stated "Never in our wildest dreams would have expected this many fans to show up on day one of the Founders Club to become part of our baseball family. We look forward to welcoming each and every one of them to the ballpark on opening day in April 2020." While the individuals and groups who signed up in person at the Founders Club event already have ensured their ability to choose their seats, the Founders Club remains open through the end of December. Fans interested in joining the Founders Club and ensuring their choice of seats along with other benefits should visit www.fredericksburgbaseball.com or www.potomacnationals.com for more information about the benefits of the Founders Club. The Founders Club event was organized in conjunction with and supported by the Fredericksburg Area Museum. The event also raised money to support the programs and activities of the Museum. Museum President & CEO Sara Poore expressed her appreciation of the public support for the team and the Museum stating "It is the FAM's goal to partner with other organizations that add to the richness of the region. Bringing so many people together at the Museum to celebrate the historic arrival of professional baseball in Fredericksburg helps demonstrate the role of the museum as a catalyst of good things in the community." The team also expressed its appreciation for support provided at the event by other valuable partners in the community including B101.5/NewsTalk 1230, Agora Downtown Coffee Shop, and Paul's Bakery.